One of the dogs rescued from Michael Vick’s dog-fighting ring has been adopted from the Best Friends Animal Shelter in Utah. Little Red, a Pit Bull, now lives on six acres of fenced property in the Midwest with her new owner. 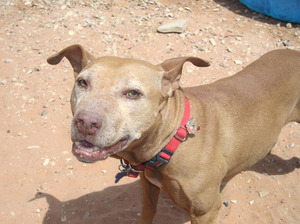 Pit Bull Little Red in summer of 2011 at the Best Friends Animal Shelter; Red was rescued from Michael Vick. A woman named Susan adopted the dog in September of last year. She first saw the dog when she worked as a volunteer at the Best Friends shelter. After fostering the dog for a six-month period – as per a court order – Susan finally signed the adoption papers and became Red’s legal owner on March 19. Despite initial hesitation to explore her new home, Red now confidently roams the expansive property and has become good friends with Susan’s four other dogs. DogTime.com salutes Susan and congratulates her on the adoption of Little Red.